Tourism activities are as plentiful as they are diverse. They can range from recreational and sports focused to health and nature activities, from cultural immersion to the ultimate extreme adventure. A pastoral region, Guanacaste offers this activity in coastal areas and in the mountains communities. Horseback-riding tours are available through tourism operators or family-owned farms that rent horses. There is no end to the diversity of hiking options available for observing various natural, historical, architectural, cultural, religious and commercial attractions. The region offers a variety of picturesque roads and adventure or leisure sites that allow touring on regular or mountain bikes. Beaches and mountains are among the most interesting riding destinations. There are sites and buildings of architectural or historic interest and National Monuments that are considered must-see places, mainly in Abangares, Bagaces, Cañas, Liberia, Santa Cruz and Nicoya. Typical towns are characterized by sodas (small restaurants serving local food), cafes and restaurants where visitors can sample the cuisine of Guanacaste. Cañas, Tilarán, Liberia and mainly Santa Cruz stand out as communities with traditions in typical food and drink. Bird-watching is possible mainly in protected areas. Many sites offer the opportunity to “get with the birds,” with Palo Verde, Curú, Isla Bolaños and Tenorio among the biggest. There are several options for visitors to observe the goings-on in the forest canopy, including various monkey and bird species. This is a most popular tourist activity owing to Guanacaste’s climatic conditions and wealth of flora and fauna, as well as its varied natural, cultural and architectural landscapes. 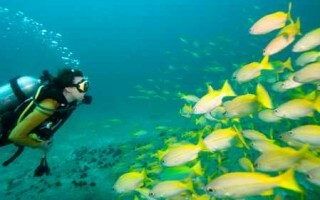 This adventure or recreational activity is becoming more and more popular in Guanacaste, thanks to its excellent dive sites and the specialized companies that normally offer services abroad. Important sites include the Gulf of Papagayo and the Santa Catalina islands. The handicrafts of Guaitil de Santa Cruz and San Vicente de Nicoya are made of pure clay using the traditional and ancient techniques of the Chorotega indigenous group. Ornaments, urns, flowerpots, vases, plates, decorative whistles and other figures are fashioned and may be bought for their fine finish and interest in several parts of Guanacaste. Visitors can also acquire other kinds of handicrafts fashioned out of jícaro (a kind of gourd) or the thipa plant, from which various paper products are made. This is one of the Northern Pacific region’s main attractions. Artisan and recreational fishing are possible, but of greater interest are the tournaments in which several world billfish records have been broken. The fish are returned to the water after weigh-in.